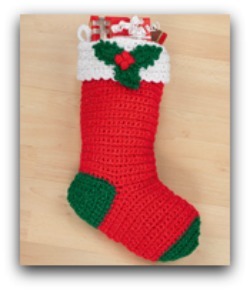 Free crochet Christmas patterns are always fun to make and stockings never go out of style. This pattern is easy and great for both the beginner and the experienced. Stocking measures 19 1/2" long. Victorian: 1 Ounce 313 Aran CA, 5 ounces 376 Burgundy CB, 1 ounce 389 Hunter CC. Crochet Hooks: 6.5 mm [US K-10.5], 4mm [US G-6]. Yarn needle. GAUGE: 13 sts = 5"; 14 rows = 4 1/2" in sc with larger hook. CHECK YOUR GAUGE. Use any size hook to obtain the gauge. (4 Medium) RED HEART ® "Super Saver®", Art. E300 (7 ounce/364 yard solid color skeins; 5 ounce/244 yard multi-color skeins). CUFF: With larger hook and CA, ch 43. Row 1 (Right Side): (Sc, hdc) all in 2nd ch from hook,* sc in next ch, hdc in next ch; rep from * to last ch; (sc, hdc) all in last ch; turn — 44 sts. Rows 2-8: Ch 1, sc in hdc, hdc in sc; rep from * across; turn. Row 9: Ch 2, sl st in first 2 sts, ch 2, sl st in next 2 sts; rep from * across. F asten off. 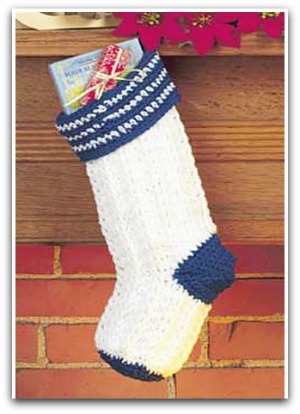 STOCKING -Leg: With larger hook and CB, ch 43. Row 1 (Right Side): Sc in 2nd ch from hook and in each ch across; turn — 42 sc. Next Row: Ch 1, sc in each sc across; turn. Rep last row until 10" from beg, end wrong side row. Fasten off. HEEL: With right side facing skip 32 sc; join CC; ch 1, sc in last 10 sc; bring other side of leg around and sc in first 10 sc; turn -20 sc. Next Row: Ch 1; draw up a 1p next 2 sc, yo and draw through all 3 Ips on hook — dec made; sc in each sc to last 2 sc; dec; turn -18 sc. Rep last row to dec 1 st each end of every row until 4 sts rem. Work 1 row even. Now inc 1 st (inc = work 2 sc in a st) each end of every row until there are 20 sc. Fasten off. FOOT : With right side facing, skip first 10 sc of heel, join CB in next sc; ch 1, sc in last 10 sc of heel, skip row ends of heel, [dec over next 2 sc of leg] twice, sc in next 14 sc, [dec] twice, skip row ends of heel, sc in rem 10 sc of heel; turn -38 sc. Continue in sc, dec 1 st each end of every 6th row twice — 34 sts. Work even until foot measures 5" from last row of heel, end wrong side row, changing to CC. Cut CB. TOE-Next Row: With CC, ch 1, dec, sc in next 13 sc, [dec] twice, sc in next 13 sts, dec; turn — 30 sts. Next Row: Ch 1, dec, sc in next 11 sc, [dec] twice, sc in next 11 sc, dec; turn — 26 sts. Next Row: Ch 1, dec, sc in next 9 sc, [dec] twice, sc in next 9 sc, dec; turn -22 sts. Next Row: Ch 1, dec, sc in next 7 sc, [dec] twice, sc in next 7 sc, dec; turn — 18 sts. Next Row: Ch 1, dec, sc in next 5 sc, [dec] twice, sc in next 5 sc, dec; turn — 14 sts. Next Row: Ch 1, dec, sc in next 3 sc, [dec] twice, sc in next 3 sc, dec; turn — 10 sts. Fasten off. Sew toe, foot, heel, leg and cuff seams. If heel rows have formed gaps in the fabric, weave matching yarn through sts on wrong side to close them. Turn cuff to right side. Hanging Loop: With CA, ch 13; sc in 2nd ch from hook and in each ch across. Fasten off. Fold in half and sew inside cuff at seam. Leaf (Make 3) With smaller hook and CC, ch 8. Rnd 1: 3 Dc in 4th ch from hook, hdc in next 2 ch, sc in next ch, 3 sc in last ch; working across opposite side of ch, sc in next ch, hdc in next 2 ch, 3 dc in same ch as first 3 dc; join with a sl st in top of ch-3. Rnd 2: Ch 1,3 sc in same st as joining, sc in next st; ch 2, sl st in side lps of last sc made — picot made; [sc in next st, (sc, picot) all in next st] 3 times *, (2 sc, ch 3, sl st in 3rd ch from hook, sc) all in next sc; rep from * to * once more; join to first sc. Fasten off. Berries (M ake 4): With smaller hook and a single strand of CB, ch 2; 8 sc in 2nd ch from hook; join with a sl st to first sc. Fasten off. With needle, weave yarn end through top Ips of all sts; draw up tightly and secure. Sew leaves and berries to cuff as shown. Weave in ends. (es); yo = yarn over; * = repeat whatever follows the * as indicated;  = work directions in brackets the number of times specified.